Now this DEFINITELY is not on! The 2-foots came home from bunny camp last night with lots of stuff (I know they did! ), but all they gave us was one toy! Now I'll grant you that it's a great toy, it's a dumbbell that's really easy to pick up and throw around, but that's not the point! Where is all the rest? There should be treat baskets, and a new cardboard house, and a ball with a bell in and and....... I WAN'T TO KNOW WHERE THE REST OF THE TOYS AND TREATS ARE!!!!!!! Flopsy Girl thinks that they are saving them for Christmas, but that is nearly 3 weeks away, surely they cannot expect us to wait THAT long? Sorry we have not been in contact (or written in our journal) for ages. Our 2-foot has been none too well, so has been at home, so WE CANNOT GET ONTO THE COMPUTER. She has the whole house to run around in, but still keeps on coming into our ONE room. Well, apart from the cardboard castle (which we have now totally destroyed), I am not sure what we will be getting for Christmas, our -2foot has not mentioned anything. Oh no, you do not think she is going to forget us? NOOOOOOO! 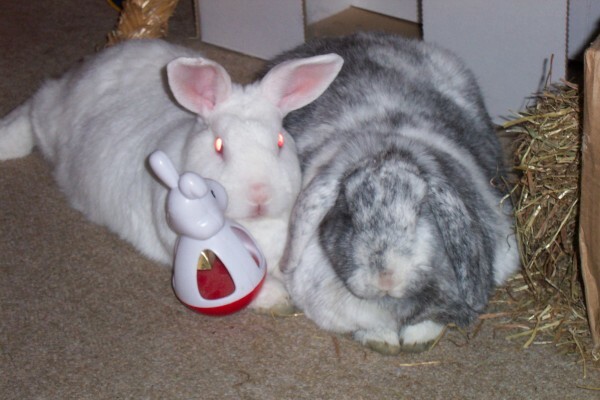 Your dumbbell toy sounds like fun, but we agree with you, you and Flopsy Girl SHOULD of received more treats. PS - Your Diary made our 2-foot laugh, especially the photographs. Your 2foots do look like fun people. We all wish to thank you again for your very kind words on Thumper-Binx. ... and thank you for the Christmas card.